I will admit when I first heard about the Drop Stop I thought it was just one of those crazy gadgets inventors try to get you to waste your money on. I actually almost passed on reviewing it all together...that was right up until I dropped my straw down The Carmuda Triangle™. You know what I'm talking about, it's happened to all of us at least once in our lifetime. You're in the drive through and your straw slips right through your fingers and down the crack between your seat and the center area of your car. That space that car makers left just wide enough for things to fall down, but our hands to not fit into. Then you're left trying to reach your lost treasures from under the front part of the seat, or using a pen or anything else you can find to try and push it out to the floor board. Oh the agony and pain...and all you wanted was a drink of your cold beverage on a hot day. It was that moment that I realized the Drop Stop was exactly what I needed. Since installing my Drop Stop set in my car I can happily say I've not had to deal with dropped straw (or anything else for that matter) down into the The Carmuda Triangle™. Anything I drop now stays right on top of the Drop Stop and easily within my reach. It's not only a life saver for me and my treasures, it's also a great safety measure against driver distraction. No more looking down trying to figure out where something went you dropped while driving down the road. Inventors Jeffrey Simon and Marc Newburger (The Drop Stop Boys) have some very exciting news! As most of you know, Jeffrey and Marc were on the Emmy Award winning TV show Shark Tank back in 2013 and since then their lives have never been the same. The experience for them was surreal, amazing and absolutely life changing to where they partnered with the Warm Blooded Shark Lori Greiner who is not only the best partner they could ever have but a true friend and part of the Drop Stop Family. 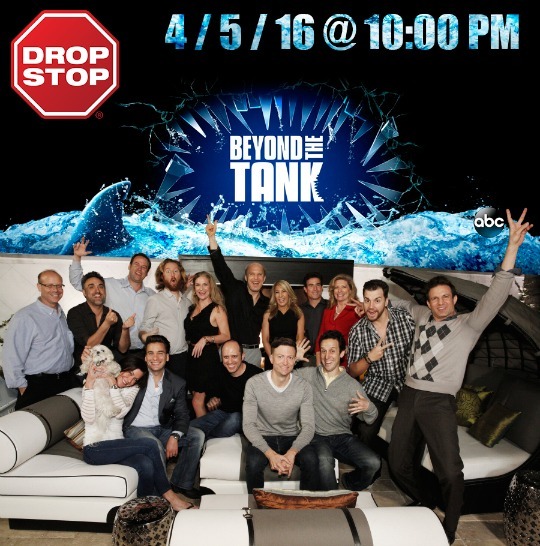 Shark Tank has now created a spin off TV show called "Beyond The Tank" which follows the entrepreneurs behind the scenes of what it is really like to be them, day in and day out, since being on Shark Tank. Their episode AIRS ON TUESDAY APRIL 5TH AT 10:00PM ON ABC!!! We hope you can tune in (or DVR) our episode and join them for this yet another exciting moment on the Drop Stop journey! Jeffrey and Marc said when they first started, they won't stop until every vehicle seat gap is filled with a Drop Stop and this episode is another momentous step into making their mission a reality! This April it will be National Distracted Driving Awareness month, and as Drop Stop was born to reduce this very thing, it is the perfect time to help raise awareness about Drop Stop, one of the only products that can truly reduce Driver Distraction. Buy now and SAVE: To celebrate Drop Stop is offering FREE SHIPPING on any order from now until midnight Sunday 4/10/2016. 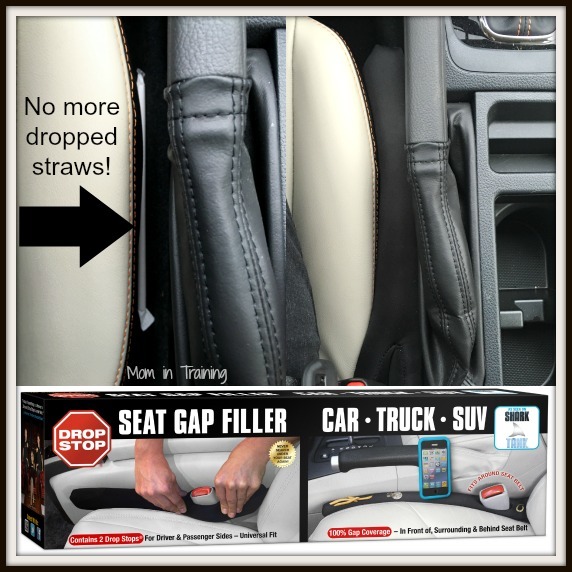 Win it: One lucky reader will win a Drop Stop: Car Seat Gap Filler. This giveaway will end April 19th at 11:59 PM EST. The winner will have 24 hours to respond to my email. If no response, a new winner will be chosen. Prize fulfillment will be made by the sponsor, I am not responsible for prize delivery or lost or stolen deliveries. Open to residents of the US. I've lost everything down the side of my car seat from pacifiers to French fries to my cell phone. Ink pens. I am always losing ink pens in my car. I have lost dvds, gift cards and so much money down the side of my car seat. I'm always losing my lighter. I frequently drop pens there. We are always losing coins and toys. I have lost change & debits cards. I lost my credit card and couldn't get it out for days. I've lost lots of change! I drop my phone down there all the time. I always drop my phone when I'm getting out of the car! I have lost change, pens and miscellaneous food. Written directions, phone, library books, DVDs, candy bars all have fallen out of sight and easy reach! My redboxs always fall down there. Its so hard to get them out. I am always dropping either my phone or my change down between my chair! I lose my phone down there all the time. I always, never fails, drop my chapstick down there!